How can you go wrong with something as simple as a propeller nut? The answer might surprise you. 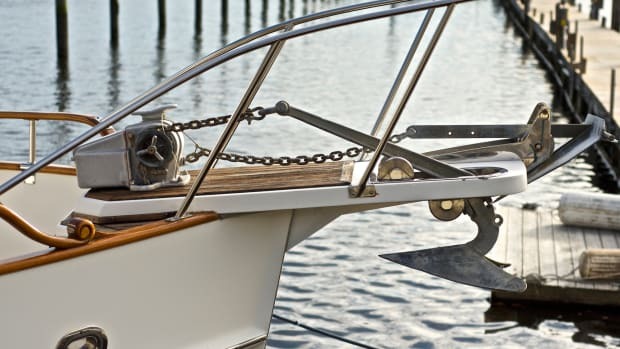 While few would deny the important role a propeller nut plays, many folks, professionals and boat owners alike, underestimate the variety of ways they can go awry. The reasoning behind this differing height nut approach is straightforward enough. The full-height nut, because it has more thread engagement, is designed to carry the lion’s share of the load, while the half-height nut is designed to act as a locking mechanism. That’s the aspect of propeller nuts most folks understand and with which they agree. The tricky part, and where the controversy comes in, involves their order of installation. Contrary to commonly held beliefs, when assembly is complete, the half-height nut should be against the propeller hub, having been installed first, while the full-height nut is farthest from the propeller hub, having been installed last. The logic for this seemingly counterintuitive approach goes like this: when the first nut is installed and torqued down, it carries all the load or tension. When the second nut is installed against the first nut and it is torqued, much of that load or tension is transferred to the second nut. Thus, it only stands to reason that the second nut (the one that carries the majority of the load), should engage more of the propeller shaft with more threads. I know for all you gearheads out there this appears to be heresy or worse, and you are wondering if I’ve lost my nut-and-bolt mind. 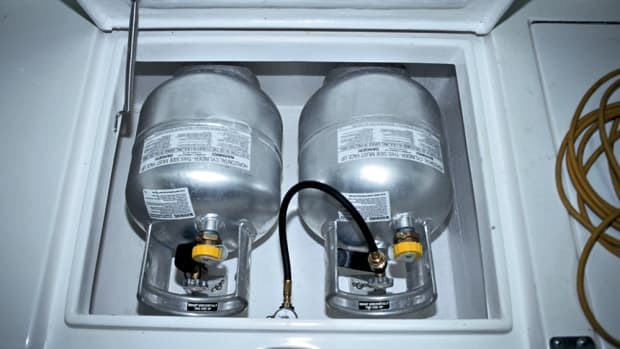 When I first began proliferating this information several years ago, it was met with the hue and cry of many in the boat-owning and marine repair and boatbuilding communities, proclaiming it sacrilege, barbaric, and just plain stupid. Some even claimed that I had intentionally misled folks to drum up business for myself and my colleagues in the industry by propagating a spate of lost propellers. Even today, whenever I share this approach, the skeptics come out of the woodwork. Rest assured, not only is this approach one I wholeheartedly endorse, but it’s also backed up with good engineering and it’s endorsed by propeller manufacturers, the Society of Automotive Engineers, the American Boat and Yacht Council, the U.S. Coast Guard, and the U.S. Navy. The latter spells this procedure out in excruciating detail in chapter 75 of their sublime (if you like this stuff) NavShipsTechManual (Chapter 075-5.3.4, Fasteners). It can be downloaded as a pdf, courtesy of Uncle Sam; I keep a copy on my iPad for “light” in-flight reading. A few months ago, I was standing beneath a client’s vessel, watching as a mechanic removed the propellers. After using a wrench to break the full-height stainless steel nut free, he tried to remove it by hand. Normally that’s easy to do even on a large, 3-inch diameter shaft such as this one. Yet, this one remained extremely difficult to remove and required the use of a wrench for nearly the entire unwinding process. That caught my attention and as I looked more closely, after both the full and half-height nuts were removed, I quickly found the culprit for the resistance. 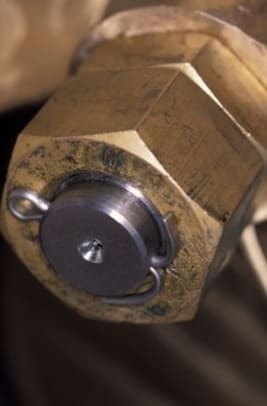 The nuts and the shaft had entered an unholy alliance that led to a phenomenon known in the world of metallurgy as “galling.” In plain terms, galling is a transfer of metal from one surface to another by friction-induced heating, thereby deforming the threads on the propeller shaft, which in turn made the nut’s removal more difficult. In essence, it’s micro-welding, and stainless steel, as it happens, is especially susceptible to this peculiarity. On small fasteners, a single galling episode can spell their ruination. For larger threads, as in this case, the shaft’s threads were salvageable while the nuts’ weren’t. As is often the case, the best solution to this problem is prevention. 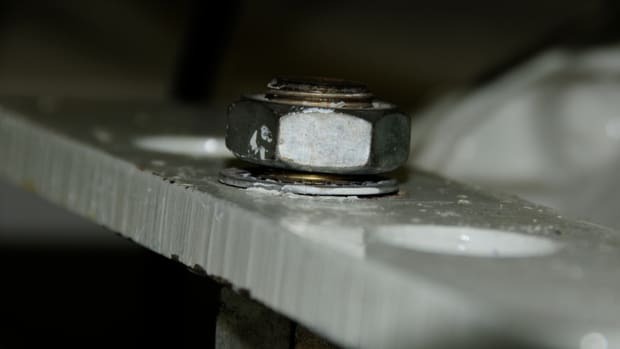 The easiest and least expensive preventive approach involves lubricating the threads, something you should consider for any highly loaded stainless steel fastener. The problem with lubricating propeller nuts is the lubrication can lead to highly undesirable loosening. An alternative, albeit a less than perfect one, involves utilization of a thread locking compound that will temporarily lubricate the threads until it sets. 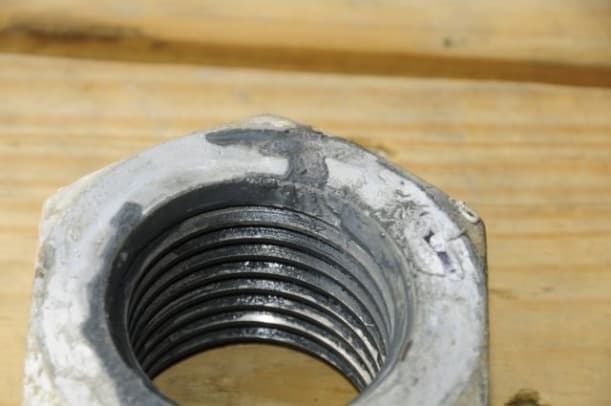 However, an even better approach, and one that doesn’t require any additive or compound, involves the use of a nut whose alloy is self-lubricating and is therefore immune to galling: brass. Yes, that’s right; the alternative (and I would argue a preferred one to stainless steel propeller nuts) is brass, and any propeller nut you see that isn’t stainless steel almost certainly is, contrary to popular belief, brass rather than the erroneously assumed bronze. While I admonished readers about the use of brass in a previous column, this is an exception to that rule. Brass, actually manganese bronze (which is a misnomer, as technically, this alloy is in the brass family), is used for a few reasons. As mentioned, it’s especially slippery, thereby protecting your valuable propeller shaft threads from galling. Brass is strong and relatively easy to machine, making it well-suited to the manufacture of nuts. 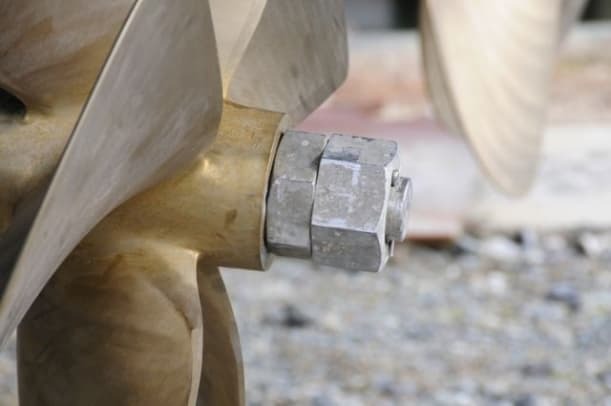 Finally, many propellers are made of manganese bronze (again, that’s technically brass) and as such, a genuine bronze nut would be cathodic to the prop, making the latter more likely to corrode when the two were in contact. If you maintain your shaft anodes, propeller and nut corrosion should never be an issue. Thus, when specifying a replacement propeller shaft, or just replacement nuts, go for the brass.